Garry Hill did a wonderful job of recreating the excitement of the 1987 non-points race called "The Winston". As they were coming through the tri-oval at the Charlotte Speedway, Bill Elliott and Dale Earnhardt bumped hard at 170 mph! Dale slid into the infield grass, and everyone thought he'd have to back off. But with the huge purse on the line, he kept his foot in it, and eventually made his way back onto the asphalt racing surface. He went on to win the event. 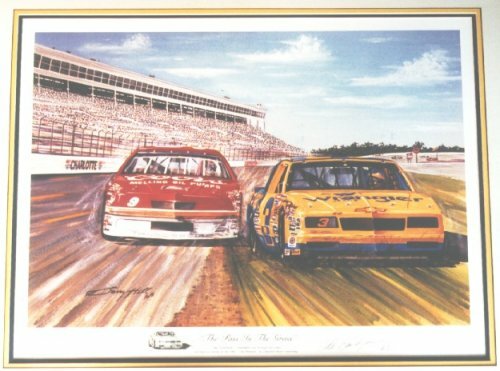 This piece is autographed by Dale Earnhardt and the artist.